1066 and all that has landed! 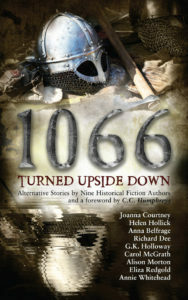 1066 Turned Upside Down – a collection of stories by nine historical fiction writers – is now out! Now what does 1066 have to do with Roma Nova? Good question. Suppose there had been a Roma Novan around trying to intervene in 1066 between Harold’s Saxon England and William’s Normandy? Could she have influenced either of these tough, ambitious and determined men and changed history? Read what happened when Galla Mitela, 11th century Roma Novan, met William of Normandy in ‘A Roman intervenes’. 1066 is the most known year in English history, and the most intriguing. It represents a key turning point: a year in which everything was up for grabs, a year in which England’s historical story could have gone any number of ways – a year of ‘what ifs’. What if King Edward’s great-nephew, Edgar, had been thought old enough to rule, and chosen as king? What if the Northern Earls has defeated the Norwegian, Harald Hardrada and King Harold’s own brother, Tostig, at Gate Fulford – or what if Harald Hardrada had won the Battle of Stamford Bridge in Yorkshire? What if Harold had defeated the Normans at sea? What if Svein of Denmark had invaded or a European political power like Roma Nova had intervened? What if William had died when he was unhorsed at Hastings or had been defeated at London Bridge in November? What if the Bayeux Tapestry carries a hidden, secret meaning about the truth of 1066 – or a time machine could alter the past? So much could have been different and now, at last, we can explore some of those ‘what ifs’ in this exciting collection of ‘virtual history’ short stories, written by known and loved writers of the period (and a few from outside it) to celebrate the 950th anniversary of this incredible year. The stunning cover is by Cathy Helms of Avalon Graphics. The collection includes historical notes of what really did happen each month alongside the fictional re-interpretations, as well as authors’ notes on what fascinates them about 1066 and why they chose to ‘change’ what they did. Each story has a few suggestions for ‘discussion’ points for schools, writer’s groups – or just your own curiosity! So where can you buy this fascinating collection? 3 comments to 1066 and all that has landed!